Blooom stands out in an increasingly crowded field of robo-advisors by narrowing its focus to one segment: workplace retirement plans like 401(k)s. By tending to Americans’ retirement assets, Blooom offers management services that often are overlooked by other advisors. The company exclusively manages defined contribution plans — 401(k)s, 403(b)s, 457s and 401(a)s. Blooom’s model is simple and straightforward: There’s no account minimum, and management costs a flat fee of $10 a month, regardless of account size. Customers looking for advisors to manage non-401(k) funds will need an account elsewhere. Investment expense ratios Not rated. Investments used are limited to plan offerings, though Blooom will prioritize funds with the lowest expense ratios. Not rated. Investments used are limited to plan offerings, but customizable by client. Blooom prioritizes index funds, with occasional use of actively managed funds. The service first reviews funds already owned. Employer-sponsored plans: 401(k), 457, 403(b) and 401(a). Tax strategy Not rated. Typical robo-advisor tax strategies cannot be employed in the tax-advantaged retirement accounts Blooom manages. Blooom works within plan rules to look at accounts as they drift out of the preferred allocation. Rebalancing occurs between 1 and 4 times per year. Registered investment advisors are available via chat, email and text. Live chat, email and text support Monday - Friday, 10 a.m. to 6 p.m. Eastern. No phone support. Special rate of $99 per year with code REEETIRE. 401(k) management. Blooom stands out for its niche strategy of managing employer-sponsored retirement plans. Even though 401(k)s are the primary retirement savings vehicle for many people, it’s rare for robo-advisors to manage them — most deal exclusively with individual retirement accounts and taxable accounts. Blooom manages any 401(k), no matter where the account holder works or where the account is held. There’s no need for your employer to have a partnership with the service. No account minimum. Beginner savers can have Blooom manage their accounts right from the start, giving them a better shot at getting off on the right foot. Free analysis. Anyone can register for an account and have Blooom analyze their 401(k) for free. It’s a fairly painless process: You’ll create a username and password, share a bit of information about yourself, then securely link your 401(k) by selecting your provider and logging in through Blooom’s site. 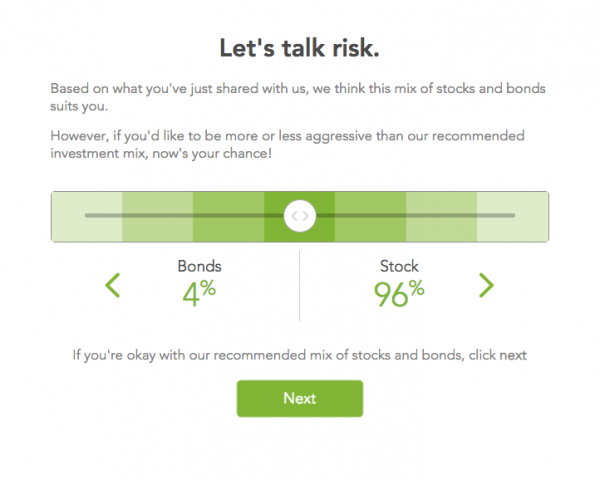 The company then tells you how your fees and asset allocation compare with its recommendations, suggesting ways to improve. 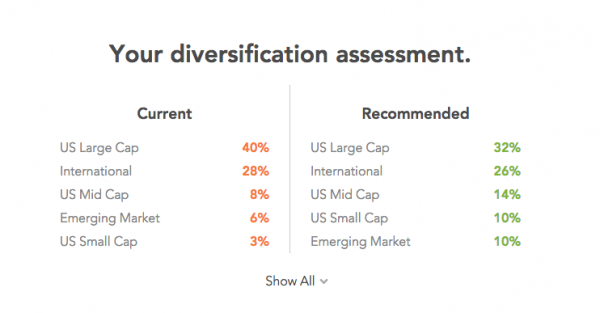 You can adjust your recommended asset allocation to take more or less risk, and once you’ve settled on a breakdown between stocks and bonds, Blooom will share its recommendation for your 401(k) compared with how your 401(k) is currently allocated and the investments available to you. Do-it-yourselfers could easily take those recommendations and change their asset allocations on their own, without signing up for a paid account with Blooom. Investment expense audit: Employer plans generally offer limited investment options, some of which can carry higher-than-average fees. Blooom works within the investments available in the account by classifying them into asset classes, then selecting the investment in each bucket with the lowest internal expense ratio. Although there are many instances when there’s only one fund in each category — and no way to lower expenses — this method can help investors lower their expenses overall while maintaining an appropriate asset allocation and diversification. Blooom says its clients realize an immediate fee savings of a median $102. Financial advisors: Blooom offers email, chat and text support to customers, including registered investment advisors who are able to answer any financial planning question. That includes topics that fall outside of 401(k) management, such as debt repayment, budgeting and preparing for major life events. Cost: Blooom hopes customers see as much value in outsourcing the management of their 401(k) as they do in paying for things like Netflix each month. There’s something to be said for the clean, flat monthly fee. Investors know exactly how much they’re paying, and the fee is charged to a credit or debit card rather than skimmed from the account balance. But there’s a downside to flat fees, too. To compare costs with other advisory services, both robo and human, it’s important to evaluate that fee as a percentage of the assets under management. Blooom says its median account balance is currently $49,123; $10 a month on that balance works out to an annual fee of about 0.24%. For comparison, human advisors typically charge around 1% of assets under management, and robo-advisors typically range from 0.25% to 0.50%. Given that Blooom is one of the few robo-advisors that manages 401(k)s, and that the company offers customers access to financial advisors, we think that’s a reasonable charge. Limited investor assessment: While Blooom’s sign-up process offers simplicity — linking your 401(k) account takes a matter of minutes — the questions determining how Blooom allocates your assets aren’t as thorough in assessing risk tolerance as we would like to see. Some of that can be explained by the company’s focus on employer retirement plans: It rightly assumes the goal of every client is retirement. However, we think investors would benefit from a more robust assessment of risk tolerance during onboarding. No phone support: Blooom’s customer support and access to financial advisors is exclusively online, via chat, email and SMS texting. per year with code "REEETIRE"
Blooom brings much-needed investment management to employer-sponsored retirement plans. That’s a significant benefit because such plans usually are the primary retirement vehicle for people who have them. Few other robo-advisors have tapped this market. But before signing up, do the math to figure out what percentage of assets you’ll pay based on your account balance and how that will change as your balance grows. Check into whether you have access to comparable services directly through your 401(k) or other employer retirement plan; some offer free investment guidance.